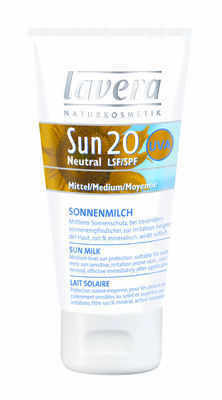 Sun sensitive Organic SPF20 - suitable for allergic and sensitive skin. Sun Sensitive Organic Neutral Sun Cream SPF20 has been developed especially for people suffering from extremely sensitive skin. Specially selected minerals provide active and instantly effective protection against UVA and UVB rays. Anti-irritating ingredients of Liquorice and Evening Primrose Oil calms the skin while Beta Glucan, Organic Sea Buckthorn Oil and Vitamin E provide active skin cell protection assisting in retaining moisture in the skin and helps to protect against environmental influences e.g. sun, wind. Free from flower extracts, herbal extracts and essential oils. Lavera Sun Sensitive Organic Neutral Sun Screen SPF 20 is Water resistant, hypoallergenc and fragrance free.